Science deniers at WUWT are a funny lot. Their sole purpose in visiting denier blogs seems to be to sing the refrain "it's not happening", with the occasional faint chorus of "if it is it's not bad". WUWT deniers in the main haven't got quite as far as "if it is bad, there's nothing we can do about it". Some of Anthony Watts' guest articles are good illustrations of that. There was a "guest essay" by David Middleton yesterday (archived here) about a press release on the NASA website about how quickly sea levels may rise. The press release was consistent with other recent estimates that seas will probably have risen by a metre or more by the end of this century or early the next, particularly if we stay on our current emissions trajectory (and maybe even if we don't). David Middleton, who you might recall thinks all lizards are the same, wanted to reject the NASA article outright, claiming that "The only way sea level rise could approach the high end of the IPCC range is if it exponentially accelerates…". And he drew a chart with an exponential curve. 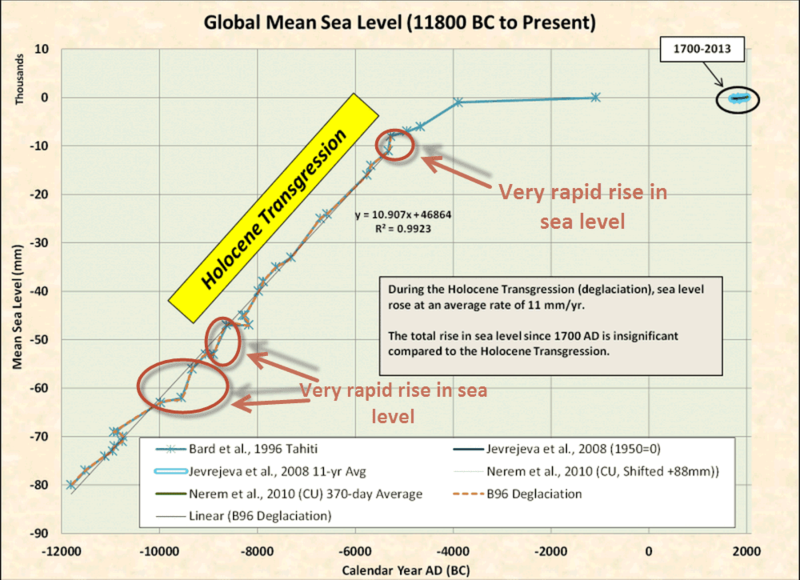 Having made that wrong statement and putting up his exponential chart, he then drew a wrong conclusion, writing: "The rate from 2081-2100 would have to average 20 mm per year, twice that of the Holocene Transgression. This is only possible in bad science fiction movies." One major flaw in David's argument was that he assumed that seas would rise according to some smooth chart, either linearly or exponentially. What he failed to factor in was that the main contribution to sea level over coming decades will be from melting ice. Another major flaw was that he himself used data and referenced a paper that showed that seas have risen at more than double his "impossible" rate in the relatively recent past. Three feet of metre sea level rise is "locked in"
In fact, a one metre rise by the end of this century is within the "likely" estimate of the IPCC report if we follow RCP8.5, and that's considered by many experts as being conservative. David Middleton assumed that seas will rise in a steady linear fashion. He briefly considered that sea level rise would follow an exponential curve, but rejected that on flawed grounds as you'll see. It's probable that seas won't follow either a linear curve or an exponential curve. The rise will be more like a series of sharp jumps, with steadier rises in between. When ice melts from glaciers and ice sheets, it doesn't melt in a nice even fashion. And it certainly doesn't send the water into the sea in nice even drips. What happens is what happened last week, when a massive chunk of ice broke off the Jakobshavn glacier in Greenland and floated off into the sea. That means that a sea level chart is more likely to look like a set of rising stairs than a straight line or an exponential curve. What David Middleton said was impossible has happened in the past. Lauren J. Gregoire, Antony J. Payne & Paul J. Valdes had a paper published in Nature in 2012. In the abstract they wrote about a sea level rise of 14 to 18 meters over 350 years (my emphasis). The last deglaciation (21 to 7 thousand years ago) was punctuated by several abrupt meltwater pulses, which sometimes caused noticeable climate change1, 2. Around 14 thousand years ago, meltwater pulse 1A (MWP-1A), the largest of these events, produced a sea level rise of 14–18 metres over 350 years3. That averages at 40 to 50 mm a year - sustained for 350 years! Though I doubt it happened smoothly. There would have been some years when there was a lot greater rise and some years less. So David's impossible is not impossible at all, is it. Let's look at David's charts. First of all, his chart of what he labels as the Holocene Transgression is based solely on a 1996 paper by Edouard Bard et al. He didn't give a reference or link to the paper, but I'd say it was this one, published in Nature (pdf here). If David had read the paper (or even looked at his own chart), he'd have come across the discussion of meltwater pulses, MWP1a and MWP1b, for example, which were said to raise sea level at the rate of "~50-40 mm y-1". Coincidentally, the same rate that I calculated from Gregoire12. David argued that it's not possible for seas to rise quickly this century because the rise over the period in the early Holocene averaged 11 mm a year (from his calculation). There's a logical fallacy in that (Telltale Technique No. 2) as well as a mathematical flaw. What he didn't seem to realise was that his own chart shows times when seas rose much more quickly than the average. In other words, using David's own chart, seas can rise very quickly. And using his own reference, it's not at all impossible for sea level to rise at more than double 20 mm a year, which he claimed was "impossible". It does take a massive amount of meltwater to rise that quickly. According to David Middleton's reference, Bard96, a sea level rise of 40-50 mm a year requires an injection of around 16,000 km3y-1 of meltwater. That would be a volume of ice, say, 200 km long and 40 km wide and 2 km deep, each year. Those retreats were over a period of just a decade. Speed it up some more, and then a bit more, and then get massive amounts of water melting into the ocean and you'll get a massive rise in sea level. Generally, deniers don't believe that sea level can rise by a metre this century (~3 feet). (Anthony Watts is a frequent denier of ice melting as it gets hotter. I think rising sea level is one thing that scares him a lot.) Following the release of the IPCC AR5 scientific report, there was quite a bit of discussion among scientists (and in the blogosphere) about the sea level rise projections. The sea-level rise ranges provided by the experts are on average higher than those of the IPCC 5th assessment. For the strong mitigation scenario (RCP 2.6), the likely range is 0.4–0.6 m by AD 2100 and 0.6–1.0 m by AD 2300. For the unmitigated warming scenario (RCP 8.5), the likely ranges are 0.7–1.2 m by AD 2100 and 2–3 m by AD 2300. That's three metres or close to ten feet in three hundred years. Over that time, most of the people living in towns and cities on the coast would have to be relocated. Imagine the storm surges! The upper boundary of the AR5 “likely” range should not be misconstrued as a worst-case upper limit, as was done in Kerr's story as well as elsewhere in the media and blogosphere. For policy and planning purposes, it may be necessary to adopt particular numbers as an upper limit, but according to our assessment, the current state of scientific knowledge cannot give a precise guide. The bottom line is - how much seas will rise and when depends on how quickly the ice sheets in Greenland and Antarctica disintegrate and melt. Although Antarctica’s contribution to sea level rise currently is much smaller than that of Greenland, recent research indicates this could change in the upcoming century. In 2014, two West Antarctica studies focused on the acceleration of the glaciers in the Amundsen Sea sector showed its collapse is underway. East Antarctica’s massive ice sheet remains the primary unknown in sea level rise projections. Though it appears to be stable, a recent study found under a major glacier two deep troughs that could draw warm ocean water to the base of the glacier, causing it to melt. Church and White (2011) - tide gauges and satellite altimetry: For 1993–2009 and after correcting for glacial isostatic adjustment, the estimated rate of rise is 3.2 ± 0.4 mm year−1 from the satellite data and 2.8 ± 0.8 mm year−1 from the in situ data. Jevrejeva et al (2013) - tide gauges compared with satellite: There is a good agreement between the rate of sea level rise (3.2 ± 0.4 mm·yr−1) calculated from satellite altimetry and the rate of 3.1 ± 0.6 mm·yr−1 from tide gauge based reconstruction for the overlapping time period (1993–2009). Cazenave et al (2014) - satellite altimetry: We find that when correcting for interannual variability, the past decade’s slowdown of the global mean sea level disappears, leading to a similar rate of sea-level rise (of 3.3 ± 0.4 mm yr−1) during the first and second decade of the altimetry era. Below are some numbers I put together in a previous article - the sea level rise associated with the complete melting of ice sheets in different regions. That's just to show there is plenty of potential for a sea level rise of a metre or more in just a few decades. Fabulous essay. Thanks to David Middleton. Climate “science” is just full of such bad science. I don’t know if I will live to see it cleaned up. Forgive me if I’m wrong but didn’t the raw satellite data show a lower rate of SLR before the more recent adjustments? And you can go to Co2 Science and find heaps of recent PR tide gauge studies that show just 1.5mm to 2 mm SLR. So who is correct? JimS isn't worried by 150 nickels. He might be more worried when he finds that it's more likely going to be 667 or more nickels in 100 years. Then he might think about what a storm surge will do. An American nickel coin is just under 2 mm in thickness. So at an average of 3 mm per year increase of sea level, what does that mean? – in two years, the sea level rises by the thickness of three American nickel coins. Lord help us, we are all going to drown! Curious George isn't so curious that he'd investigate how satellites are used to monitor sea level. Hint: it's not done by taking snapshots of waves. Satellite measurements of the sea level change strike me as an extremely difficult undertaking. The sea surface is far from smooth, waves can be many meters high, how do you measure an average rise of 1-3 mm per year? The NASA website explains how it is done, but it looks like – we are measuring this, and it must be an average sea level, because we say so. Magic. I applaud them for trying but I would highly appreciate an analysis of underlying uncertainties. One of the problems of linking to an offsite image is that you never know what might happen to it. It might disappear. It might be replaced by an uncomplimentary photo when the host finds out his site is swamped by WUWT world. For graphs with an x-axis in years, it might confirm your claim – or it might not. Tripping over my feet there, MWS. Indeed it should be, though I expect that three metres is also locked in already, it will just take a bit longer (hopefully). Guns and feet. When will the US catch up? Quite. Who on Earth still uses feet these days? Oh yes - The USA and Liberia. Just curious - do they still use 'bushels' and 'board-feet'? This is 2015 not 1890. Can we all just stick to the metric that the entire world has been using for decades now? Saves confusion like the above. If Americans need to convert metres to whatever mediaeval or Roman system they prefer they can use 'Google Convert' surely? Here, we use a combination of a continuous high-resolution sea-level record, based on the stable oxygen isotopes of planktonic foraminifera from the central Red Sea and age constraints from coral data to estimate rates of sea-level change during MIS-5e. We find average rates of sea-level rise of 1.6 m per century. As global mean temperatures during MIS-5e were comparable to projections for future climate change under the influence of anthropogenic greenhouse-gas emissions, these observed rates of sea-level change inform the ongoing debate about high versus low rates of sea-level rise in the coming century. There's also Blanchon et al. (2009) on late Eemian stepwise SLR which seems to have been rediscovered since Hansen et al. (2015) was put out for review. Within East Antarctica, the Wilkes Basin holds the largest volume of marine ice that is fully connected by subglacial troughs. This ice body was significantly reduced during the Pliocene epoch7. Strong melting underneath adjacent ice shelves with similar bathymetry8 indicates the ice sheet’s sensitivity to climatic perturbations. The stability of the Wilkes marine ice sheet has not been the subject of any comprehensive assessment of future sea level. Using recently improved topographic data6 in combination with ice-dynamic simulations, we show here that the removal of a specific coastal ice volume equivalent to less than 80 mm of global sea-level rise at the margin of the Wilkes Basin destabilizes the regional ice flow and leads to a self-sustained discharge of the entire basin and a global sea-level rise of 3–4 m. Our results are robust with respect to variation in ice parameters, forcing details and model resolution as well as increased surface mass balance, indicating that East Antarctica may become a large contributor to future sea-level rise on timescales beyond a century. Sure it may take a couple of centuries to really take of, but it will be devastating and since it's gravity-driven, it is unstoppable. Note to Wutters: this is what we are playing with right now. Denial is not a helpful stance to adopt. Covers much the same ground as Church and reportage by Kerr. Thanks for all that BBD. I doubt deniers would ever acknowledge sea level rise even if it were to top the white cliffs of Dover. Erik the Viking is a much-under-rated movie in my opinion. It was made in 1989 so the Hy-Brasil submerging scene is very prescient, but if one watches carefully it's apparent that there are a number of commentaries on topical subjects. I remember watching the scene in the cinema when the movie was first released, and being struck then by the fact that the message of global warming was sailing over eveyone's heads. Not long after I attended a seminar given by David Suzuki, who said that we had about a decade to institute effective mitigation. The millenium passed with nary a whimper of action, even with the widespread adoption of the interweb during that critical decade. It's really just a matter of watching the train wreck now. The reason satellites don't work very well on sea level is they're not really designed to work as submarines.